Wow! Finding a job as a truck driver was much more difficult than I expected. Granted, this is mainly due to the economy as a whole. 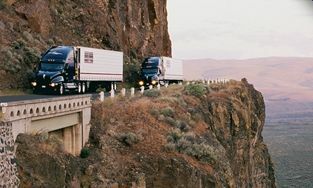 Normally, trucking jobs are everywhere. But times are tough and things aren't the way they usually are. While attending truck driving school to obtain my CDL license, I applied to a ton of companies. I ended up receiving about 3 pre-hires from the job applications that I submitted to various trucking companies. So, I thought I was in good shape. I ranked the companies from my favorite to my least favorite and called truck company number one. They told me I was good to go and would leave in a few days for orientation. Great! I was thrilled! But then I got a dreaded voicemail from one of the company recruiters about 24 hours before I was scheduled to leave. They cancelled my Greyhound Bus ticket and said my orientation had been cancelled. So, I called them up to see what was going on. The recruiter I spoke with was very vague on the phone, but said since the economy is in bad shape, they have to cut down on who they accept and my application was declined after further review. I was given no reason behind why it was declined. This wasn't the end of the world. I was really looking forward to that specific company, but I had backup companies. So I immediately got on the phone and called company #2. That recruiter also indicated that while I did receive a pre-hire , they were unable to accept me now. She said I can go on the road in 6 months then re-apply. Thanks for nothin! Yeah, I was having a bad day! I call up company #3 and get a voicemail saying my recruiter would be out of the office for a week. If we were recent CDL graduates, we were supposed to wait until he was back in the office to call. I did speak with another recruiter at the company, but she would not help me out. I had to go through my original recruiter. Sigh. So to those of you who are starting to apply, just apply everywhere! You never know who will back out on a pre-hire with you. I don't mean to scare you off, I just want to tell it like it is out there right now. In the meantime, I started applying to more companies. The hard part about applying to so many companies is the time it takes. Each online application (or paper application for that matter) can take up to an hour or even longer depending on how detailed it is. This is very tiring, but I sent out as many as I could. For each application, I called a recruiter at those trucking companies the next day. Time and time again, I was told they are not taking recent CDL graduates and don't know when they will start again. A bit of advice to those just entering the industry. At any other point in time, I'd recommend going to a private CDL school. But right now, companies are not really taking recent CDL grads. However, they are taking applications to attend their own CDL training. I think this is the best way to go. We actually have a page on this site detailing some of the companies who offer company sponsored CDL training, so check it out. I think things are getting better though. I just received a call from a recruiter stating they are hiring again and have heard a couple other companies are taking off their hiring freezes. Typically, this time of year is when freight starts picking up. So I hope the rest of you have an easier time than I did. So anyway, with each passing day, I kept hearing "no" from the recruiters and started running out of companies to apply for. I did manage one pre-hire , but she had no clue when I'd be able to start. Many other companies said to try back in a couple months. Sorry, but I need a job now! Finally, something came through. I had a little inside contact with a company and they accepted my application! They got me all set up for orientation and told me when I'd be leaving via Greyhound Bus. The trip would take about 15 hours, but I was just excited to finally get started. So stay tuned! I'll be posting all about my experience at orientation and what it's like to go out on the road with a trainer for an extended period of time. My hard work in obtaining my CDL is starting to pay off!